After being fired from his post as Moscow’s longtime mayor, some analysts speculated that Yury Luzhkov might very well stage a campaign for the Russian presidency. Over the past few months, however, evidence has begun to accumulate that Luzhkov is actually attempting to flee the country. On Tuesday, ITAR-TASS reported that the former mayor has been granted an entry visa to Great Britain. 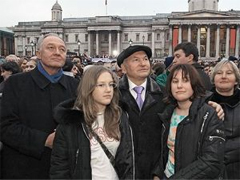 While there was no talk of a permanent residency visa for Luzhkov, a source told ITAR-TASS, the entry visa was granted on the basis of “reunifying their family.” Shortly after he was fired, Luzhkov sent his teenage daughters to London to study. His wife, billionaire real estate mogul Yelena Baturina, is also currently in London. According to Kasparov.ru, Baturina’s status as a major investor with significant financial interests in the British economy allow her to hold a special British business visa. Thanks to this visa, she can obtain a residential permit and then make a claim for British citizenship. The news comes two weeks after Luzhkov failed in an attempt to obtain citizenship in Latvia. He applied shortly before New Year’s, having deposited 200 thousand Lats (about 400 thousand USD) into a Latvian bank account; he reportedly already owned real estate in Jurmala. However, Riga declared the disgraced mayor persona non grata and put him on a blacklist of foreigners. Media reports later surfaced that Luzhkov was trying to obtain citizenship in Austria. The ex-mayor himself says that he has no plans to leave Russia “if the motherland itself doesn’t disown me.” According to a source close to the mayor, Luzhkov simply does not want to rely on Russian passport services and decided to obtain one from a country in the Schengen Area. If he does decide to flee to Britain, Yury Luzhkov would not be the first Russian public figure in trouble with the Kremlin to do so. Oligarch Boris Berezovsky took asylum in London in 2001 after Russian authorities began investigating his business activities. Britain has turned down all three extradition requests to send Berezovsky back to Russia, where he was convicted in absentia of embezzlement and theft in several different criminal suits. Yury Luzhkov was fired by Russian President Dmitri Medvedev on September 28, 2010, as a result of “a loss of confidence.” His decision was preceded by a massive propaganda campaign, in which federal television aired multiple scandalous stories criticizing the mayor and his wife. Medvedev later specified that he fired Luzhkov because of the high level of corruption in Moscow.